Republic of Gamers (aka ROG) from ASUS is one of the most popular lineup of gaming laptops, so it’s not a surprise to see the Taiwanese brand continuing to introduce new offerings in the range. In fact, the popularity of the ROG series can be gauged from the fact that the company has used the same branding to introduce its dedicated gaming-oriented smartphone, dubbed the ROG Phone (first impressions). 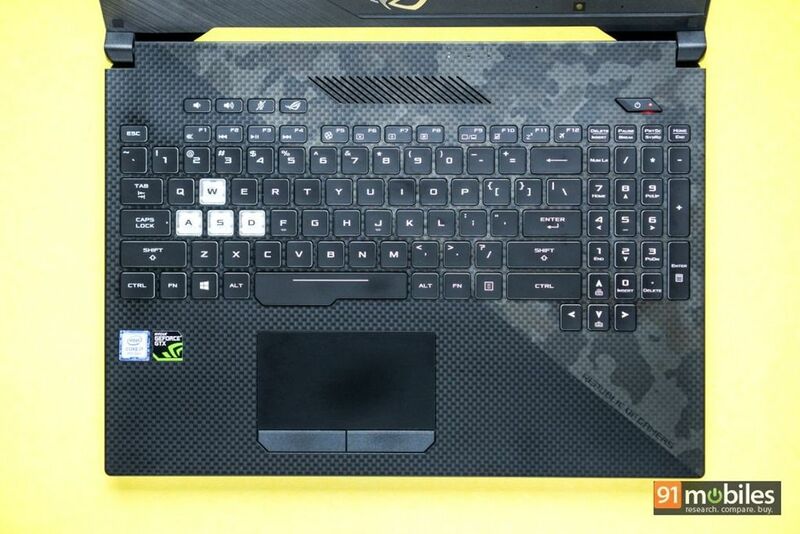 During the same launch event at Computex, the company also took the covers off the second-gen Strix SCAR laptop, which comes equipped with a loaded spec sheet. But confusingly long naming aside and a starting price of Rs 1,39,990, is the ASUS ROG Strix SCAR II the right choice for you? That’s what I’m here to find out in this review, so let’s begin. The ROG series of laptops has always been known for its flashy design aesthetics, and the ROG Strix SCAR II takes that to the next level. 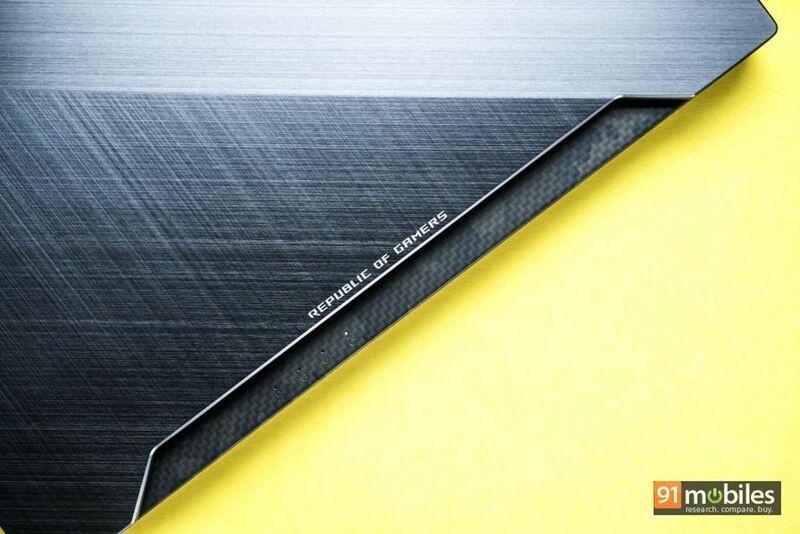 You’ll of course, find the usual elements like the RGB logo on the lid, but that’s amplified by the dual-tone texture. Referred to as SLASH Dual Surface Treatment, the upper right portion features a hair-line brushed finish, while the bottom part has an anodised finish – with these textures representing the collision of two opposing forces, as per ASUS. The flashy theme continues once you open the laptop, as there are camouflage markings all around, giving the impression of a battlefield. 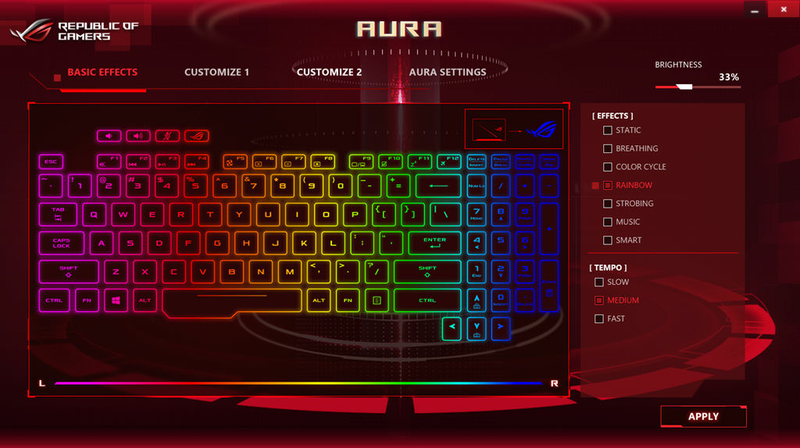 The keys also sport four-zone RGB colours, making the gamer feel all charged up even before he / she has started playing. That’s not all, there’s an RGB strip at the front side of the GL504 too. It’s worth noting that while the ASUS laptop sports metallic construction on the outside, on the inside, it uses polycarbonate. However, the build quality seems quite robust with no flex on the body whatsoever. Speaking of flex, you’ll find some of that on the rig’s 15.6-inch display, if you press the panel from one corner or the other. 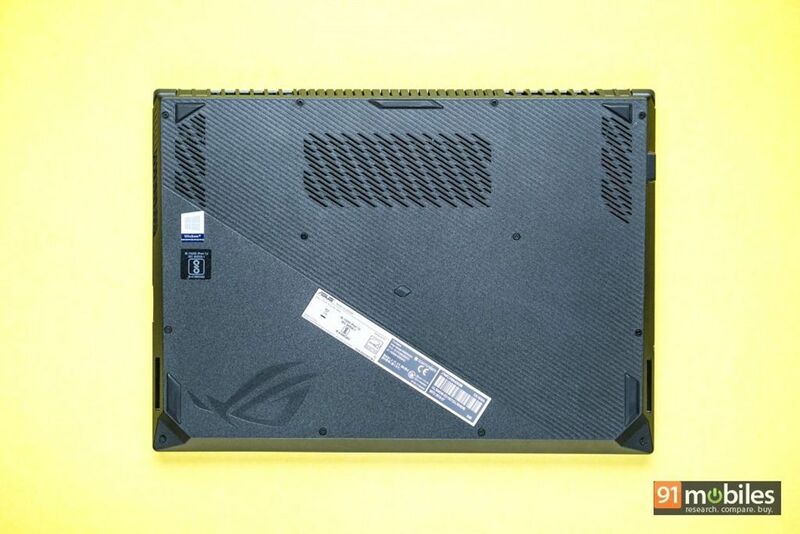 ASUS must be commended for the fact that even though the Strix SCAR II GL504 is a 15-inch laptop which comes with a dedicated number pad, the device doesn’t look massive, thanks to minimal bezels around the screen. Sadly however, you’ll find a rather large chin at the bottom, which seems to serve no purpose apart from featuring the ROG emblem. What’s even stranger is that the webcam is tucked on the corner of the chin, making it a weird angle for making video calls. It’d have been better if the brand would’ve opted for a more conventional placement, i.e. on the top of the display. In terms of the I/O, ASUS has made sure that you won’t miss any ports. On the left, there’s the charging socket, an Ethernet port, a display port, an HDMI port, two USB Type-A ports, a Type-C port, and lastly, a 3.5mm audio socket. The right side holds the lock port, another Type-A port and a full-sized SD card slot. Being a gaming laptop, there’s no dearth of cooling vents on the ROG Strix SCAR II. Dubbed HyperCool Pro, the machine features dual-fan design with 12V fans and an extended cooling plate on the rear. The lid also features a trapezoidal cut to ensure that the fans can pass the air through. 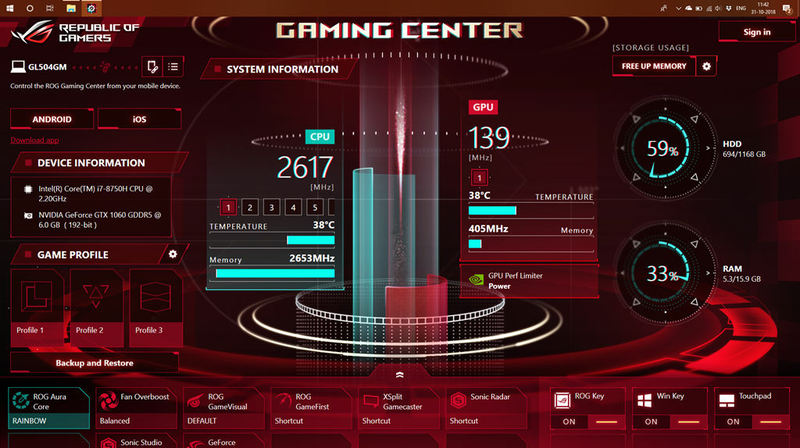 If you need the cooling fans to work at their full speed, then ASUS has offered a Hyperfan mode, which can be enabled by pressing the F5 key in combination with the Function key. The ASUS Strix SCAR II also offers a solid hinge mechanism, with the ability to use the screen at up to 130-degree angles. Even though it’s a large laptop, you won’t find any issues in opening the lid with a single hand. That said, the machine does have a considerable weight as it tips the scales at 2.4kg. 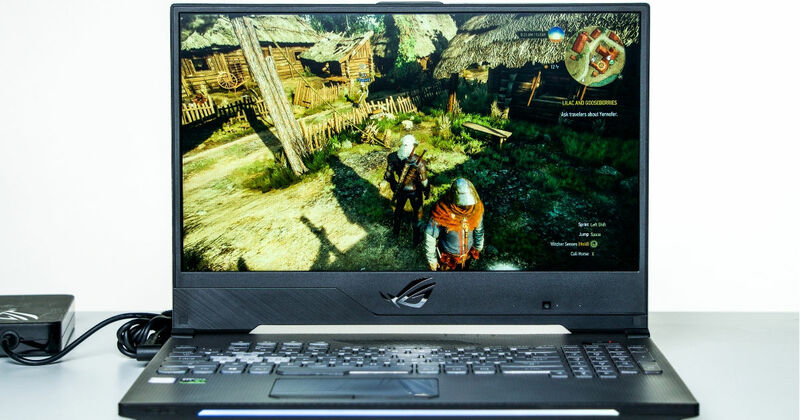 It’s also relatively thicker (even when compared to other gaming-centric laptops). Coming to the display quality, the 15.6-inch IPS panel on the ASUS GL504 sports a resolution of 1,920 x 1,080 pixels. The screen offers impressive visuals with ample brightness levels, so it can be used outdoors as well. But the biggest highlight of the panel is that its refresh rate is 144Hz and gray-to-gray response time is 3ms, the benefits of which I’ll discuss in the performance section. With GameVisual, you can also allow the display to adjust the settings while you’re playing racing games or FPS ones, or watching movies. Sadly though, the laptop misses out on NVIDIA G-Sync support. 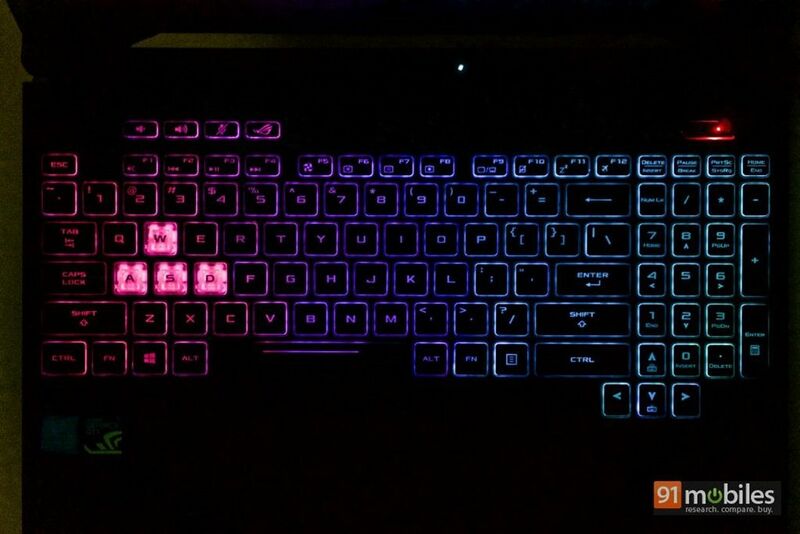 For a gamer, the keyboard is perhaps the most important thing (next to hardware, duh!). And ASUS has tried to take care of that aspect fully. Not only you get a full keyboard with enough space between keys and 1.8mm travel, but the W, A, S and D keys are transparent as well. You also get direct shortcuts for increasing or decreasing the volume, toggling microphone and access ROG Gaming Center (which we’ll discuss in the next section). As far as gaming is concerned, gamers will find themselves home with the placement of keys. It’s easier to press a combination of keys and different RGB zones make it easier to imprint on the muscle memory about different combinations. And if you find it distracting enough, then ASUS lets you tweak that to different effects and colours with the Aura app. That’s not to say that the Strix SCAR II GL504’s keyboard is the best I’ve ever come across. Its travel isn’t as good as I’d have wished for and the layout gets relatively longer time getting used to. But once you’re habitual of that, typing becomes a lot quicker and accurate too. Unlike smaller laptops, it’s also appreciable that the ASUS’ laptop has enough space for resting your palm while using the keyboard. The trackpad on the ASUS ROG GL504 comes with Windows precision drivers to offer precise navigation. The trackpad is also quite large making it easier to navigate. Furthermore, I liked the fact that the there are dedicated left and right-click keys, unlike laptops which offer gestures for the same as you get better tactile feedback with the former. 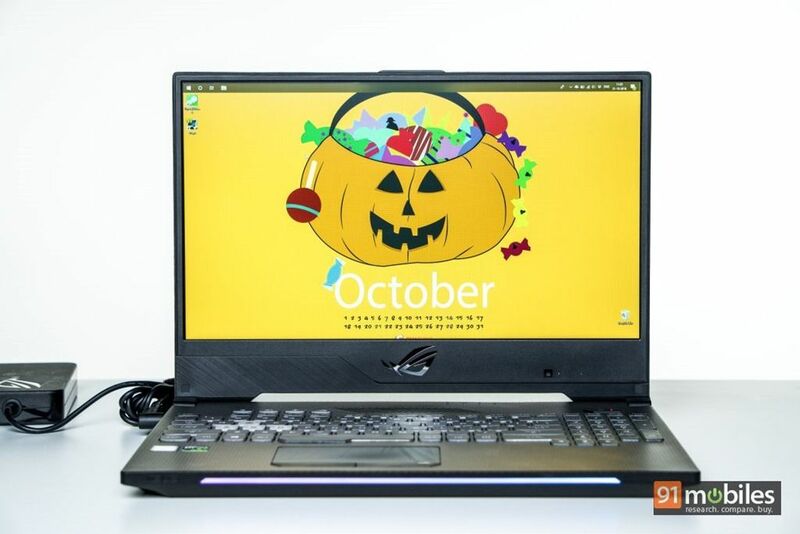 Powered by Intel’s 8th-gen hexa-core Core i7 processor and 16GB RAM, the ASUS ROG Strix SCAR II GL504 is easily one of the most powerful laptops around, and that shows. During my three week-long use, there wasn’t even a single instance where the laptop showed any trace of lag. I consider myself a bit of a power user as I use two browsers with around 50 tabs open in total, iTunes for streaming music, Franz for staying connected via Slack, WhatsApp, Messenger, Telegram and more, a couple of Word documents along with image-editing apps like IrfanView or GIMP. Of course, that’s not what the SCAR II is meant to do. 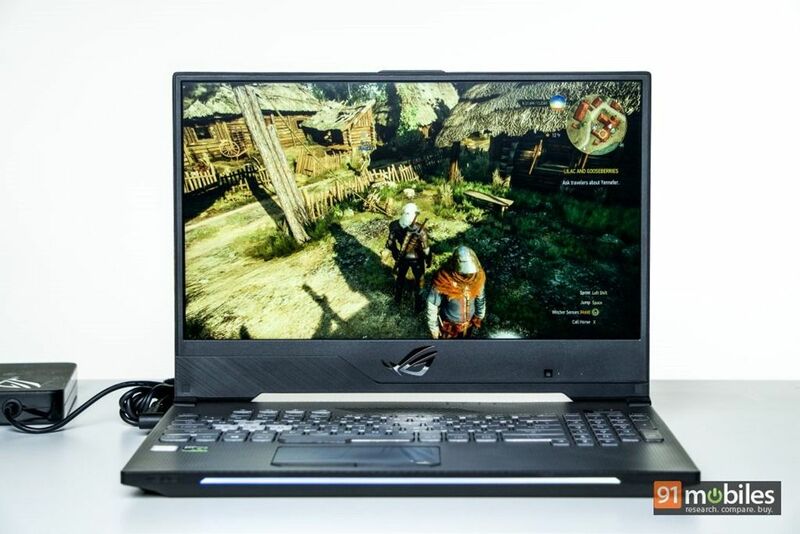 So let’s cut to the chase – I played popular open world game Witcher 3 and the i7-8750H CPU clocked at 2.2GHz along with NVIDIA GeForce GTX 1060 with 6GB graphics card ensured that it runs smooth like a butter. In fact, even at Ultra settings, the game was able to offer constant frame rates of 50 fps, which is nothing short of impressive. Coupled with the super-fast response time, there were no choppy frames or motion blurs even after playing for a considerable time. Of course, games like Asphalt 9 run like a charm on this hardware. Although the laptop’s fans were working at their full speed to ensure that it doesn’t get too hot, which meant that the noise was relatively loud. Though thermal management is good, after 30 minutes of gaming, you’ll find the rig to just become slightly hot in the area above the keyboard. 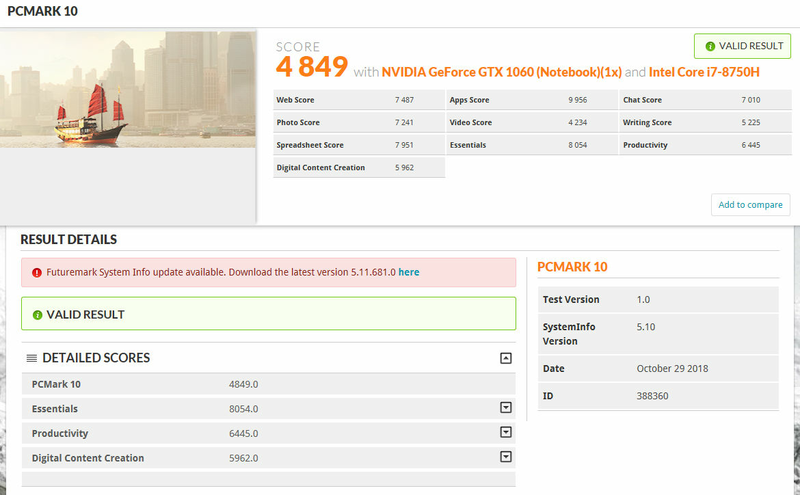 If you’ve any doubts whether the internals on the laptop are powerful enough or not, then benchmarks put them to rest. In PCMark 10, the GL504 scores 4849 – which is quite impressive and is possibly the highest among the devices we’ve tested recently. 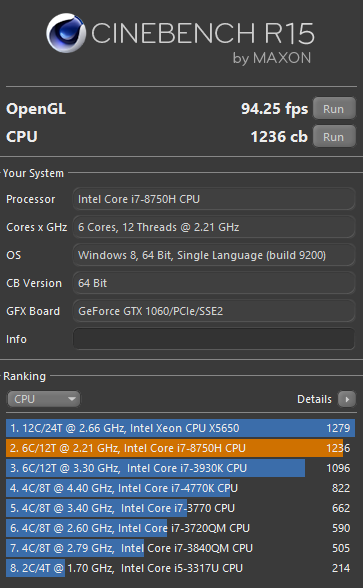 In Cinebench R15, the CPU scores 1,236, just below the Xeon class processors from Intel. For memory, the ASUS ROG Strix SCAR offers the best of both worlds… as the OS boots from a 256GB SSD, ensuring faster boot times and faster performance (2,343.3 MB/s read speeds and 946.8 MB/s write speeds on CrystalDiskMark) overall, while there’s a 1TB HDD to let you store all your games. As far as the sound quality is concerned, the GL504 won’t disappoint you. The audio output is loud, offers ample bass, and clearer mids too. However, the speakers tend to vibrate when kept on a surface as they’re positioned on the side. 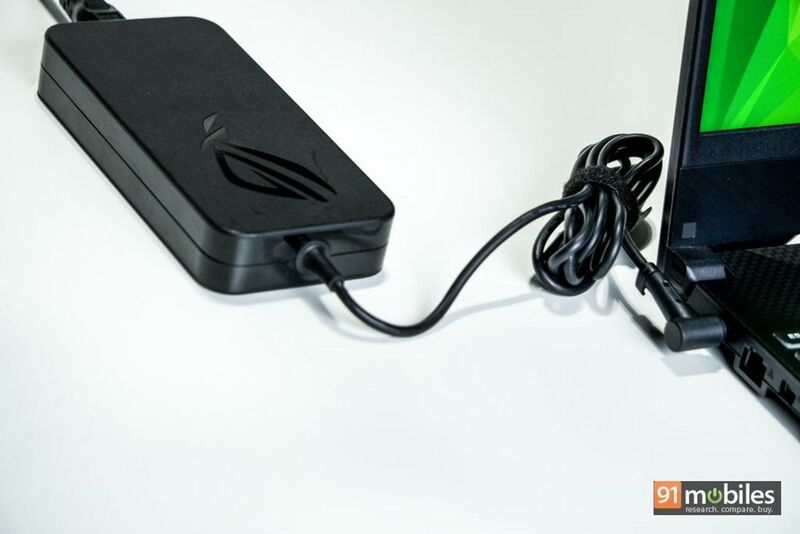 Another highlight of the ASUS’ offering is that it comes with RangeBoost technology that offers four antennas to ensure that Wi-Fi connection remains strong. As far as the standards go, the laptop supports 802.11 ac, which can deliver speeds of up to 1.7Gbps. ASUS’ ROG Strix SCAR II GL504 comes equipped with a 66WHr battery, which the company claims to deliver three hours of battery life. My usage was pretty much similar as I got around two hours and 30 minutes in better performance and best performance modes. That said, it’s nowhere close to the runtime touted by modern-day laptops. What’s appreciable though is the fact that the machine juices up from 10 to 100 percent levels in about 75 minutes. It’s a different matter however, that the 180W adapter of the GL504 is rather large and chunky. 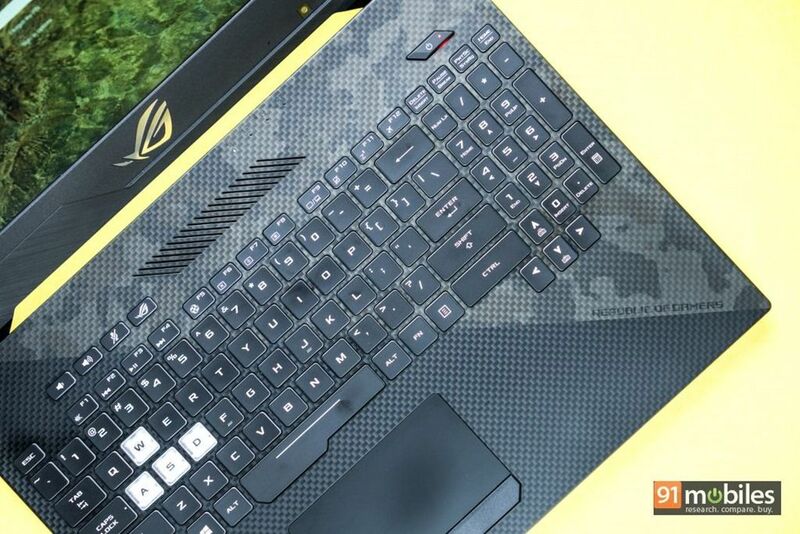 There’s no doubt that the ASUS ROG Strix SCAR II GL504 is a gamer’s delight. 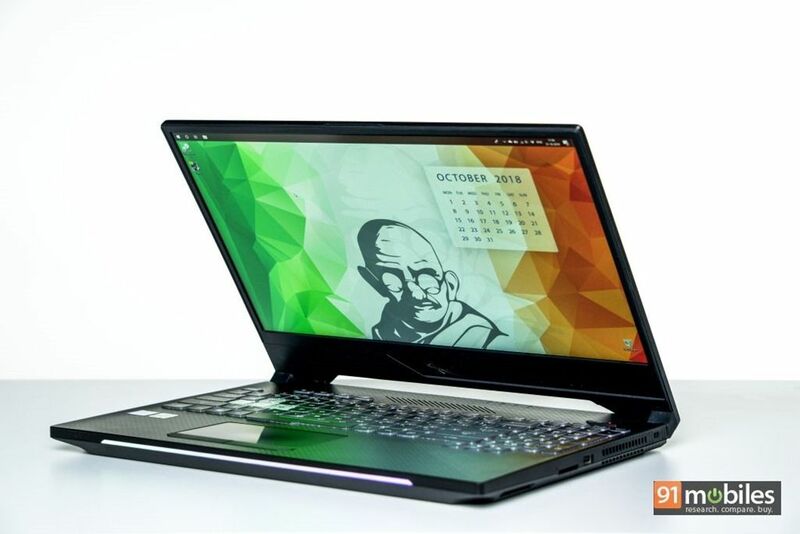 It has everything a gamer could ask for – a large display with fast refresh rate and response time, powerful internals, well thought-out keys, good thermal management, loud sound output – and all that’s packed in a design that will turn heads. While battery life could’ve been better, gamers would mostly use the device while it’s plugged in. Of course, all that comes at a huge asking price too… Rs 1,39,990. If you want to opt for the higher-end model with GTX 1070 and 512GB SSD, then you’ll need to shell out Rs 1,79,990. 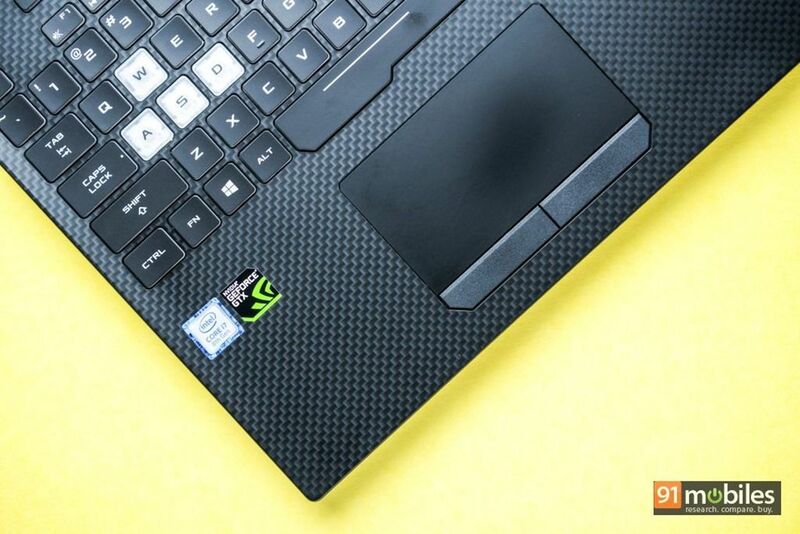 And at this price, you’ll find other machines too that are vying for the gamers’ attention. There’s the Acer Predator Helios 300, which is priced similarly and offers similar specs, though offers a 128GB SSD instead of 256GB and is weighty (at 2.7kg) in comparison. 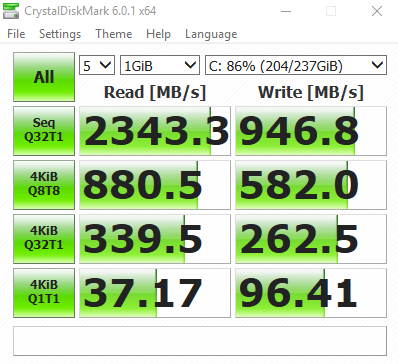 MSI’s GP63 and the Dell G7 7588 on the other hand, are priced significantly lower, and boast almost the same spec sheet, though Dell’s offering also ships with a lower SSD capacity. 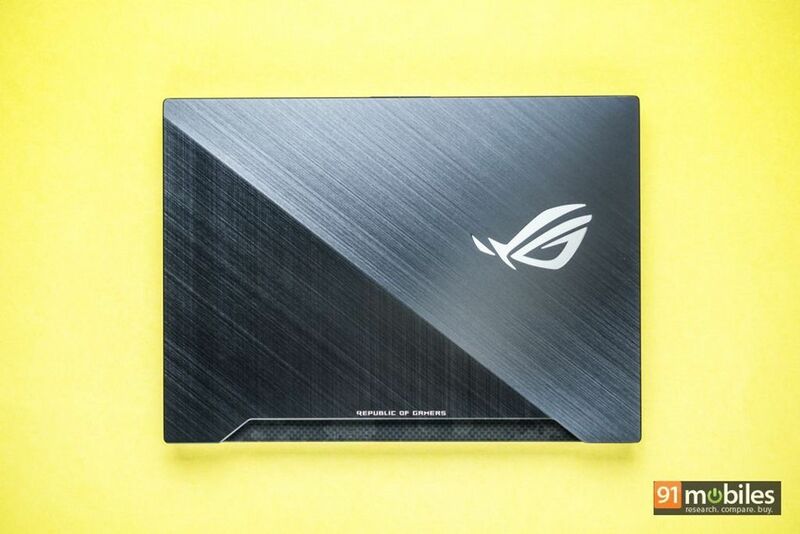 However, none of these laptops can match the panache of the ASUS ROG Strix SCAR II GL504, and that makes it an incredibly attractive option when coupled with the powerful innards.